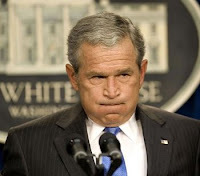 “Our Entire Economy is in danger right now.” Well, I am relieved President Bush finally gets that the world is not a happy place at the moment but did he really need to set off the alarms so catastrophically? With a straight face and monotone voice he said that inaction will result in a severe recession and a financial markets meltdown. I am not so sure. Last week I would have been more in agreement but this week, believe it or not, I am feeling more optimistic. To me it felt like he was calling out that the house was on fire but the fireman had already arrived. Don’t get me wrong the economy and the financial markets are still in a big mess, but I don’t think being in it, or out of it, is contingent on a quick bail out plan. By saying what he said however, he perhaps created a self-fulfilling prophesy. They do need to help alleviate the bad asset problem, but wouldn’t the markets respond better to a good solution then a quick solution? Even a quick solution will take a lot of time to implement. It is just so hard to trust someone who has been proven untrustworthy when it comes to knowing what to do in response to this credit “crisis”. There has been some good news in the market place, including Buffet’s willingness to make an investment in Goldman Sachs to the tune of $5 billion. Private capital is finding it’s way in to financial institutions in need. The forces that be also did a lot of other ‘stuff’ last week, which although seems extreme, was necessary, and did serve to calm things down a little. What the markets need right now is time to digest and breath. I believe that if this administration did not position this bail out as the be all and end all, it would not be. Now that a lot of smart people have had more than a minute to think about possible solutions, it is time to listen to them. Sadly the speech that President Bush gave tonight offered no opportunity to do that. Congress is likely to pass something tomorrow, because our fear invoking ( note not fearless) leaders told them they have to, but I just hope it is not another big mistake to add to the long list of other ones. Next Post Why Not Help Main Street?